There can be many different reasons to choose Relais Villa Vittoria, but I believe the main strong point is the environment: the "Romantic Shore", location where the Villa is built and the nature surrounding it. 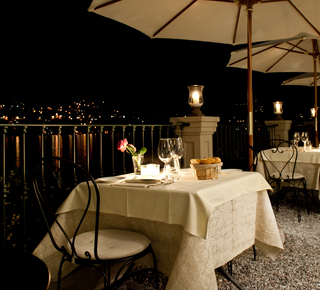 Our restaurant for romantic candlelight dinners on the lake view Terrace or in our Canteen in the suggestive "Enoteca"
Our Menu is Mediterranean style with a touch of local cuisine. A Pool Bar is open for a light lunch under the Jasmine pergola in our garden solarium by the lake.